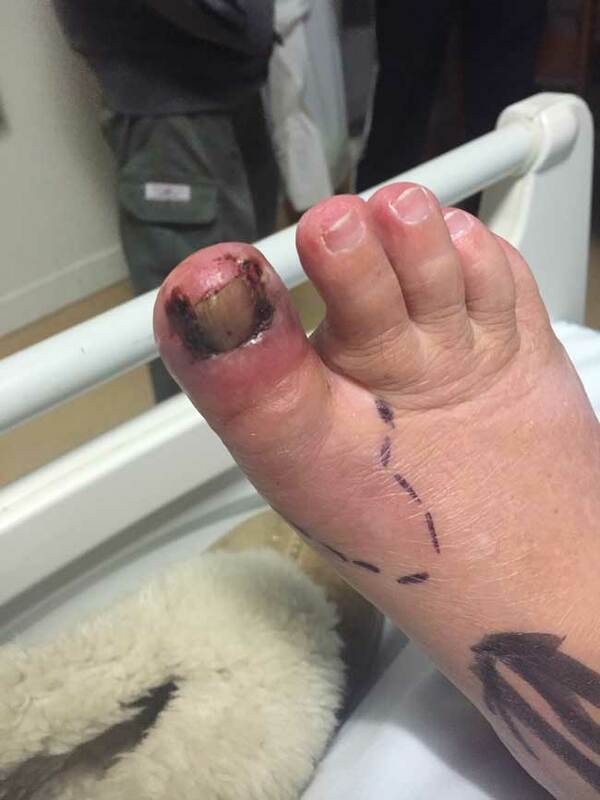 The 89 year old female patient had a eight day course of antibiotics four weeks prior to Photo 1, the infection looked as though it was resolved but then it came back eight days prior to taking the pic. The patient was given another course of antibiotics and had taken them for six days but the infection kept getting worse. A decision was made that if it got any worse the patient would be taken to hospital the next morning. She was initially treated with a quarter of a teaspoon Dehydroascorbic Acid (DHAA) and ascorbic acid poured directly onto the wound and on the most inflamed areas. Around a quarter of a teaspoon Dehydroascorbic Acid (DHAA) and Ascorbic Acid serum diluted in water was rubbed into the rest of the foot and lower leg up to the knee. This was repeated twice daily for the first three days but all subsequent applications were diluted with water for all areas. Antibiotics were continued for the first two days then the prescription ran out. The combined DHAA and Ascorbic acid content of the undiluted serum was aproximately 15%. Below is 24 hours after the first application. 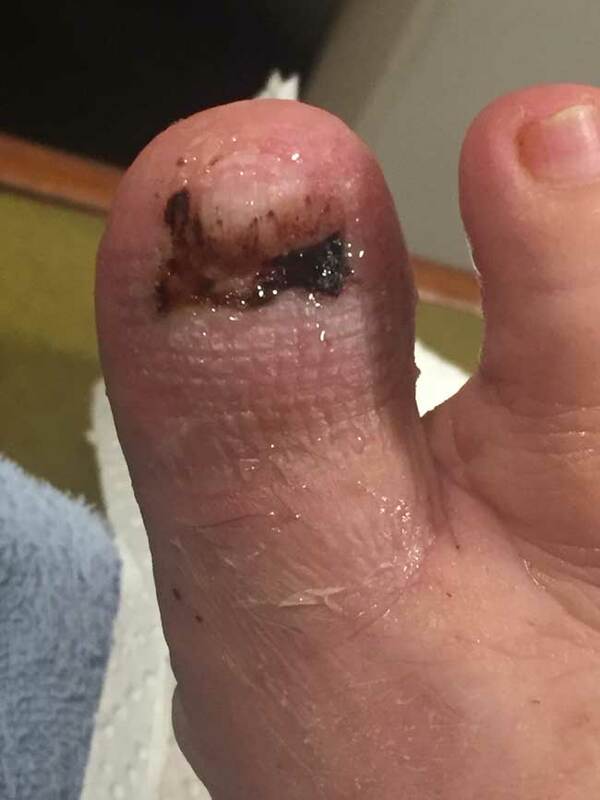 Wound shows reduced swelling of infected area and eruption below toenail ejecting matter. Colour of skin improved significantly. Swelling of the foot and ankle reduced to normal size. Pain considerably reduced. Note the pressure in the vein leading to the big toe where it meets the ankle, pressure protrusion reduced in photo 2 when compared to photo 1. The next three pics are at 4 days, 6 days and 9 days after commencement of DHAA treatment. 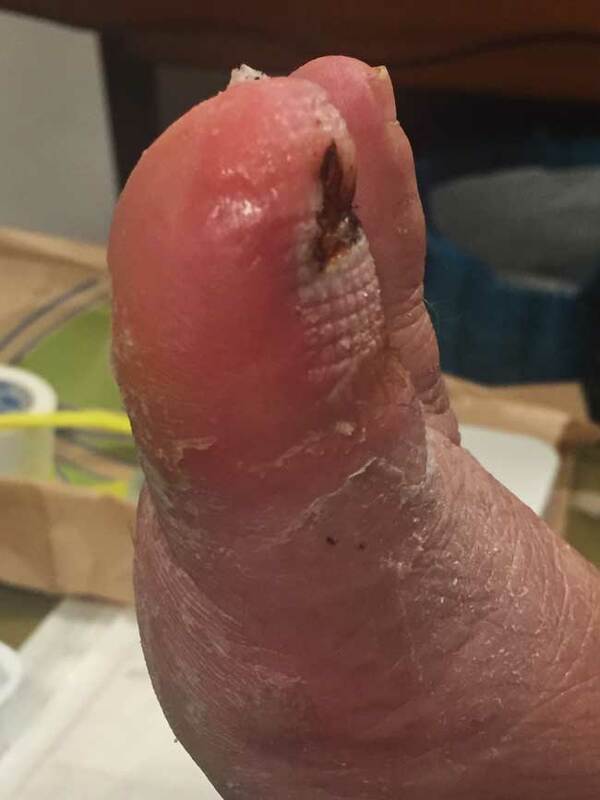 At three days the infection was well under control and shrinking quickly, the creased stretched skin below the nail on the fourth day was caused by the prior swelling associated with the infection. Area of rupture is partially obscured by this, skin colour is close to normal by day 3. By day seven only the rupture scab is visible and skin colour is completely normal. The yellow nails are the result of a chronic fungal infection and this is the probable cause of the infection. A scrape on the ankle two weeks prior to onset triggered this Cellulitis infection in the big toe. Patient given oral antibiotics for two weeks then hospitalised for a month with frequent debridements and constant IV antibiotics for three weeks. Patient in hospital three weeks before photo 1 and just before toe nail removal and debridement to the bone and joint. Photo 2 Discharged from hospital ten days later and toe looking very good, told to watch out for recurrence at time of discharge. The patient panics, the five weeks on constant antibiotics have played havoc on her digestion and she dreads being put back on them and maybe losing the toe this time. She insisted on trying the DHAA Vitamin C serum. As DHAA, vitamin C and glycerine are natural products and this ladys insistance at keeping away from hospital we mega dosed the foot. Half a glass of DHAA Vitamin C serum was mixed with half a glass of distilled water. Paper towels were soaked in the solution and the towels wrapped around the foot, ankle and lower leg up to the knee. 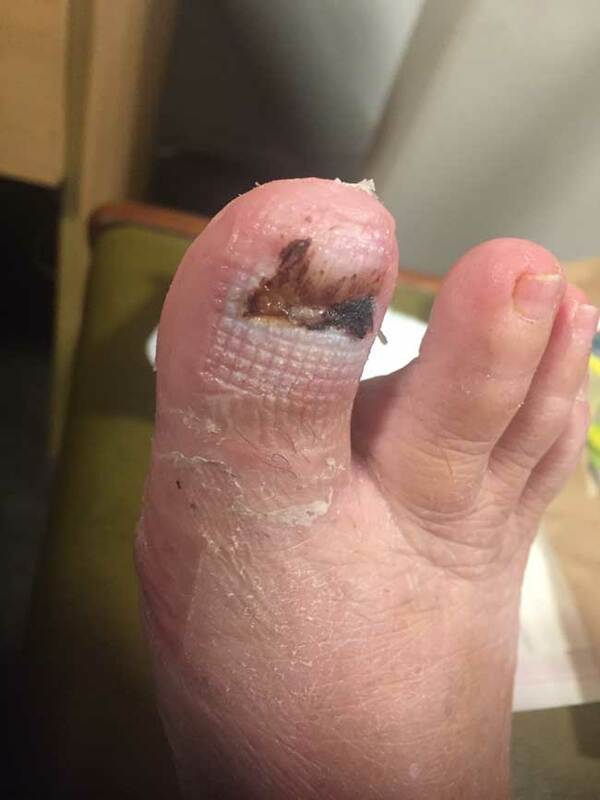 The tip of the infected toe was left uncovered as she had been told to keep it dry. As the DHAA Vitamin C serum contains no water, it was applied undiluted to the open wound area. After two hours the towels were removed and the toe bandaged with the undiluted DHAA Vitamin C serum still in place. Photo below is the following day when she came back for another application of the serum and bandage change. The clear liquid is the vitamin serum. Swelling appears reduced and colour certainly improved. Patient applied the DHAA Vitamin C Serum for another six days and the healing continued without further incident. Patient left with sore joint because the infection and debridement damaged the cartlidge and joint. Surprisingly, and against the advice of the surgeon, the toenail grew back completely!